I had an email from a friend on UKV and he uses this module when i told him the problem he said a couplke of the 04050c range have a lower output. It's the 04050a series that are ALL 6 Watts. The 04050c series are ALL 12 Watts. Look at the previous post link to TI.com for the data details. A protected 18650 can handle around 5A output, that's about 18W. Though, the problem is not the continuous current, but inrush current on start-up. It can trip the protection. I've read that some protected 18650s work okay with a booster. Guess it depends on the specific protection circuitry. 2C for a a protected 14500 is 1.5A, but I think you can get 2A out of them before the protection tips. That's way too low for a booster, but you can run two in parallel and possibly get by as long as the protection doesn't trip. Of course, the best thing to use is a high drain cell like an IMR 18650 or LiPo flat cell. An IMR 14500 is good for around 6A so one of those should be fine for most settings. The hobby LiPos are great because they have really high drain rates. There's never any issue with those. The charge density for a high drain LiPo (in terms of volume) is pretty much the same as an IMR round cell, but they they can put out way more current. I tested 14500 Trustfire flame with this booster circuit, it gave about 3 amps of current? Haven't been able to look at anything yet had to have a new roof and internal ceilings on my workshop....what a nightmare!!!!! Interesting, so you can get 3A out of a protected 14500 and the protection doesn't trip? Didn't know you could get that much out of one. I've only used the IMR 14500s myself. It's actually the IMR 14500 that did better than the protected 14500. You get lower current with the IMR cell because there's less voltage drop due to lower internal battery resistance. For any DC converter you have to think in terms of of power, not just current. Since voltage is higher, current is lower. Output power doesn't change and input power has to equal output power plus inefficiency. Even though charge capacity is lower for the IMR cell, it's wasting less power internally. The charge is used more efficiently and you get better mileage off the charge it carries. Don't know if it makes up for a difference of 300mAh, but it helps at least. It's fairly safe to take a protected cell to the drain limit since the protection will just disconnect the cell, but for an IMR cell you'd have to load test in a fire and explosion safe container (or just on a bench with a pair of goggles if you're feeling brave, which I've done). The IMRs will vent them if you overload them. Should take quite a bit more than 6A to do it though. IMR round cells are typically 8C on their safe discharge limit. I did a load test on a couple of the 1000mAh round cells you find in a eGo and it took 20A to vent them. Those cells are actually pretty tough even though the cycle life is crap for them. Be interesting to hear what it takes to vent a protected 14500 cell, less the protection of course. new to e-cigs in Nov 2011 & just getting ready to try my 1st mod build....so glad I found this site & all the great info/builds you've posted! if I fail at building my own mod, I may have to see about getting one made by you...yours are amazing! thanks for posting & for the e-juice calculator app too!! Thank you AlleyKat. Congrats and welcome to the forum. Good luck building your first mod, I'm sure with the info posted on the site that you will be successful on building a mod. The site is finally blossoming w/ member contributions. If you run in to trouble or have a question, post it in the Modders Section. If the question is related to an existing thread then post your question there. Otherwise start your own New Thread. Forgive me for being such a newb, but am I reading this thread right that a 15K resistor will give me a fixed output of 4.2v? Hey Chaos, welcome to the forum. I don't believe that it was discussed on this forum. Perhaps it was at ECF. I found a post at ECF by proax9. He said he used a 90k between Vout and Adj. Leave Adj to Gnd empty. You may have to tweak the 90k value due to tolerance differences. Excellent. Thank you very much! I have found new information that makes this easier for me to understand. Craig is the expert and has talked about Mosfets in great detail on a couple of forums. Read thru the postings for pitfalls. I can only tell you what worked for me through trial and error. Where could I find this old Resistor table? I would like to get the voltage range lower than 3,78v. The table was never revised but increasing the value of the fixed resistor between the Output and Adj pins (3 &4) will decrease the voltages, both low and high end. A 100k ohm between 3 & 4 and a 10k in series w/ a 100k pot from pin 3 to gnd will give you approximately 3.5v to.... I think it was 5.5v. If you play with the 10k and go lower in value, you should be able to bring up the high end of the range. As I said a few times before.... voltage range will vary depending on the resistor tolerance value. Go with 1% resistors, 1/8 watt. Okey. The output voltage behaves like that with this chip. Thanks for guidance. I never use resistors which have precision value above 1%. It's always a little challenge to solder small thin or thick film resistors but in the end solution is much smaller. I have been looking for some other booster regs to use in vv mods but I haven't found the "perfect" one. I have some potentional candidates. Anyone else found a different kind of single battery suitable booster regulator than ptn04050c? The TI website has about 8 different PTN 4050C models. Which one are people using? And do you get that package shown in the pictures or do you get just the chip? There are two through-hole: CAD and CAH. They have posts which are easier to solder to. The other two are surface mounts which are a bit harder to solder to. does it matter if I use CAD or CAH? 1) My 100K potentiometer (single turn) seems to want to stay at 3.99 volts until you turn it half way, so you only have a half-turn to adjust from 3.99 to 6.3 volts. It is really touchy and sensitive, although you can indeed adjust through the range with careful fine adjustments. Have you encountered this? 2) I'm using the same p-channel mosfet as in your diagram (the dpak), and I can turn it on by touching only the lead from the gate (with either a 10M, 15M, 22M, or 30M resistor). 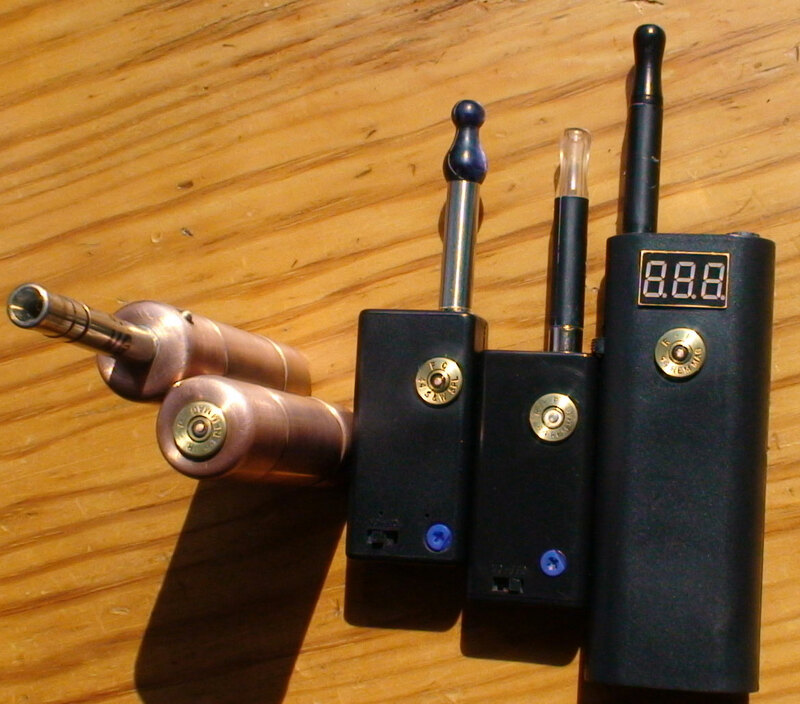 I haven't tested it out with an atty yet, I'm just using one of those voltage testers for 1s-6s li-po batteries. I'm wondering what the purpose of the 1k resistor to ground is as the second contact in the touch sensor? 3) I'm planning on sticking all this into a 3AA battery box (with on/off switch) and internally mounting the atomizer connecter (hoping to hide most of my carto and muffle the sound of it firing). I'm wondering if that little switch will be alright at the voltage the box will be handling, and also if I should have it breaking the ground wire, or the positive wire coming from the battery? Thanks for all this great info, I'll be sure to post some images if / when I get this thing working! Welcome to the forum ddubois, glad this forum and it's members can aid you in your mod building. 1) Some pot are not so linear (single turn) and yes I have experience the crappy adjustments. Some better than others. A multi turn trimmer would be better. I've used a 25 turn trimmer but didn't like it much. Takes many turns to see the slightest voltage change. Perhaps a 12 or less turn trimmer would be ideal. 2) There maybe a big difference when using the touch mosfet with and without a load attached. Most of the time I have to up the D to S resistor w/ a load attached. With a P-Channel it is really NOT necessary to use the 1k gate resistor. The battery polarity is protected by the Drain to Source high resistor. However I would differently use it for an N-Channel being that there is the battery Negative on one side of the contact point and the battery Positive on the other. If the contacts touch together like some loose change or keys in your pocket, BAM, a dead short of the battery. 3) I usually replace the low current slide (on/off) switch w/ a 3 amp. The 50ma switch that comes w/ the boxes will work as long as you don't switch it on and off with a load (arcing will destroy the switch). Also, the 50ma switches have a much higher internal resistance that will be seen as a voltage drop. See for your self by comparing the voltage on both sides of the switch. I have done this and have seen a noticeable difference. Breaking either Neg or Pos doesn't matter. But in a box mod the switch is below the neg of the batt so it is a lot easier to break the neg side. Also replace the thin wire off the slide switch to the neg contact with a heavier one. Awesome, thanks for the clarification! I'll swap out that tiny switch with a 3A, and play around with how the MOSFET behaves when an atomizer load is attached. About the touch switch though, does this mean I don't need both touch contacts? I can just (for example) put a screw through the box and solder the gate / high resistor to that? I don't know a lot about electronics, but lately I've been reading everything I can, and it seems a bit strange that I can activate it by only touching my finger to the one lead coming from the gate / high resistor. The circuit requires TWO contact points. W/ or W/O the 1k. You maybe confusing this with a Capacitance Touch Sensor. It can't be used for high current so perhaps to control the inhibit/Remote pin. Looking at the pictures I took on my phone last night when I called it a night, I realize I had it wired a little funny. I'll have to get back to you tomorrow when I correct the wiring. I am using the STD30PF03L p channel mosfet (dpak), but I had the high resistor in the wrong hole, somehow making it so that only touching the gate lead is required to activate it. Wierd, but then again, I don't really know what the hell I'm doing lol! I didn't have a battery holder ready to go, so when I tested the circuit, I was holding the positive and negative battery leads to an 18650 trustfire flamer with my right hand, and I was turning on the MOSFET by touching only the gate lead with my left hand.... I do believe the ground is required now, unless of course you have one finger on the negative battery terminal at all times.... Wow. I don't think I could be the only person who's done this, or maybe that's just wishful thinking. At any rate, I hope this post keeps anyone else from making the same mistake! I got it all working now, but I noticed something a bit funny. Everything works great on a full charge, but after an hour or two of use, the touch switch does not seem to fully open the MOSFET (unstable voltage drops). I'm running the negative contact to ground with a 1k resistor, and using a 22M as the high resistor on the MOSFET. The voltage seems to drop and not stay stable, but if I lick my finger or use a piece of metal on the touch switch, I get a fully opened gate. Would replacing the 22M resistor with a higher (say 30M, or add a 10M for 32M total) resistance, or removing the 1k ground resistor solve this? You need to go higher with your Drain to Source resistor. Although some say it is too high, 99% of my touch builds use a 100 Meg. That's what I figured, I think I'm starting to grasp the way this thing works. I don't have a 100M resistor on hand, I will try wiring up a 30M in series with the 22M tonight and see if that remedies it. I'm hoping it doesn't require much more resistance than that, although I have a few 27M, 24M, 20M, and 15M I could bump it up with, but it's already cramped in there lol. Even using the 100 meg ohm does not guarantee smooth operation 100% of the time Occasionally but not often I have to find a soft meaty part of the finger to operate it. On rare occasions, wet finger. I am realizing this now lol. I now have 52M of resistance, and it works for longer, but it still starts to only partially open the gate before the battery is dead. I'm using an atomizer connector as a touch switch, which works great, except for one thing I discovered this morning. If you have an actually "wet" finger (after rinsing my coffee filter), the air hole and groove around the centre positive pin are a perfect moisture trap. The unit will stay on with water in there, and it takes quite a while to try it out lol. I'm wondering if you could use the same circuit replacing the touch switch with a small 50mA tactile switch, do you think that there would still be too much current going through it? I have 2 more 4050 boards, and in the near future I plan to build 2 more 3xAA box mods. This build is mostly a prototype build for me to figure out the layout and type of components I prefer, plus I threw it together rather quickly so it's not as pretty as most I've seen lol. A small tac switch in series with a resistor (prob 1-2k) to limit current should replace the touchpad just fine. at 3.7v, the 1k resistor will limit current thru the switch to about 4ma .. the switch should last forever. That gives me an idea. Could you eliminate the need for a large 3A on/off switch and just use the small 50mA on/off switch built into the 3xAA battery box if you used it to break the ground wire (with a 1k resistor) coming off the MOSFET gate going to battery negative? I'm wondering if the MOSFET would be consuming any power, it'd be more of a switch to turn the touch switch on and off, rather than the whole box, but in effect, it does turn off the whole box. Basically, the touch switch circuit would remain the same, but that little 50mA on/off switch would break it's 1k ground, and the 3A on/off switch I'm using wouldn't need to be in there taking up space. Man i really love building this kind of mod but i only have a little knowledge about electronics i wish you can post pictures step by step on how you built this sweet little baby! Great to here it. Congrats on your build. I don't see why not. That would be cool. Fitting both in a .44 mini AA box would be some feat. You would have to use the smallest package size of the mosfet and the dig pot. and try to squeeze in the tact switches or switch where the pot would go. When you click "REPLY", you will see "Additional Options" below the text box. Then "Attach .... browse. Sounds like you connected it like the schematic/diagram. Try using one outside leg and just the middle leg of the pot and let's see what happens. Not that you wired it wrong. Another note: I have used countless 04050c converters in the past and never had a problem until recently. The latest batch of 04050c's, at least the last 3 of them, I had the same problem not being able to vary the voltage. All I got was battery voltage out. Even removing all the caps and leaving Pin 3 empty w/ no resistor across Pin 3 & 4. It should have given me 5.0v out but instead I only saw battery voltage. This suggests that the convert is at fault and not the additional components. A multimeter would be handy for trouble shooting or you will never know what your output is. Also you can use it to see if there is a break in your board. I hope the module is not blown. Had a few like that.